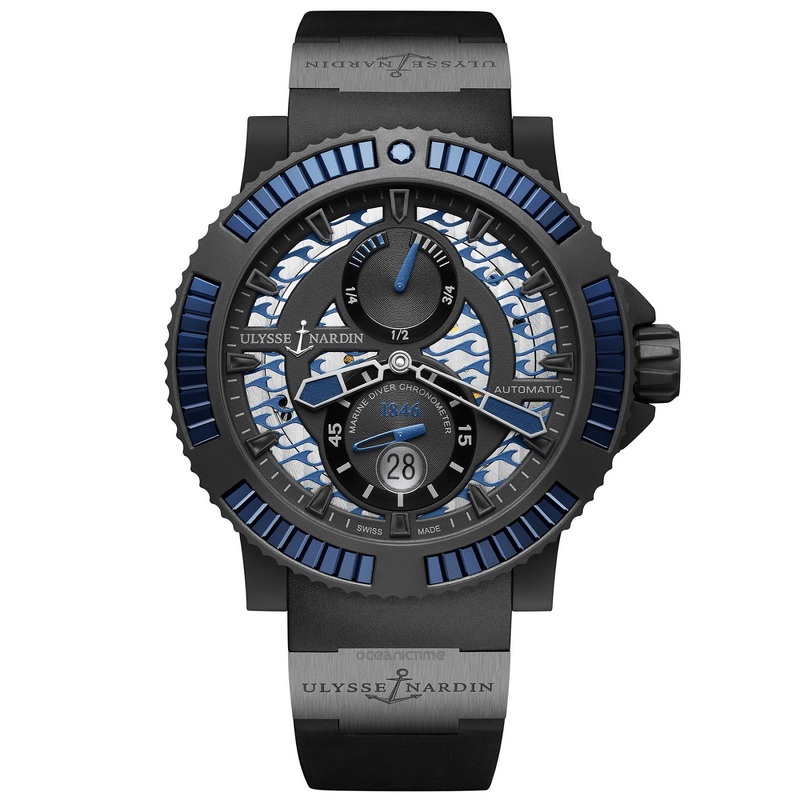 There’s no doubting its rich seafaring heritage, but Ulysse Nardin’ latest model in their diver family is a little out there. 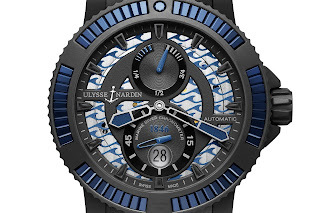 I’m talking specifically about the Diver Back Sea’s ceramic stone studded divers bezel created using an exclusive stone-setting process known as 3S! 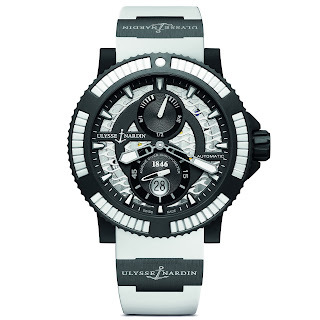 The bezel has four studded segments with 9 baguette-cut stones in each, so that’s 54 stones plus the 5 gaps in between them and a single 12hr marker making a grand total of 60 – okay so a 60-min. dive-time scale of sorts. In black these look pretty much passable. I quite like the blue elements, but in white, despite making such a striking contrast against the black rubber – they look a little like someone’s glued on a bunch of Richard Hammond’s whitened teeth – giving whole new meaning to the term bezel teeth! 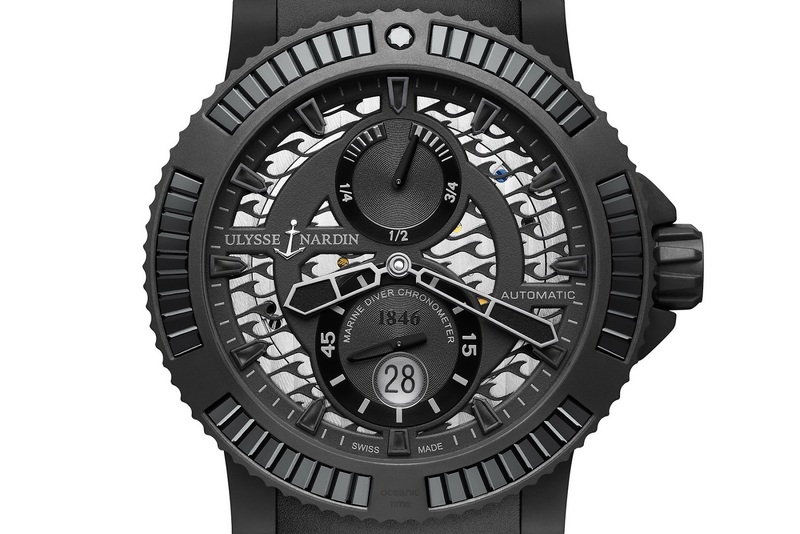 Besides the exquisite open-work dial another distinguishing characteristic of the Diver Black Sea is its 45.8mm Stainless case that has been coated with vulcanized rubber. 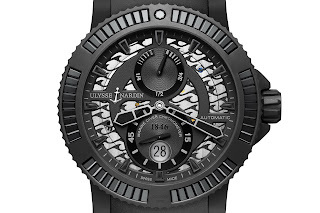 Actually the rubber is pretty cool, it extends to the unidirectional divers bezel, with a rubberized screwdown crown for added water-resistance to depths of 200 meters. Finally - power comes from a self-winding in-house caliber, the UN-26. Not a fan of this UN diver? You might like THIS!